Ardys M. Dybsand, 83, of New London, died April 15, 2019 at Bethesda Grand in Willmar. Funeral services will be 11:00 a.m. Tuesday, April 23, 2019 at Peace Lutheran Church in New London where visitation will be held one hour prior to the service. Burial will be in Terrace Lawn Memory Garden in Montevideo. Arrangements are with the Johnson Funeral Home in New London. Ardys Marie Dybsand was born on November 6, 1935, the daughter of Harm and Mary (Rienholt) Hinderks. She grew up on the family farm in Stoneham Township of Chippewa County and attended Maynard High School, graduating in 1953. She continued her education at St. Cloud Teachers College. On June 23, 1956, Ardys was united in marriage to Alton Dybsand at Immanuel Lutheran Church in Clara City. They made their home and farmed west of Maynard and she worked as a teacher for over 26 years. In 1980, they moved to New London/Spicer area where she worked as a substitute teacher and was program director for twelve years at Group Living Home in Spicer which they built and owned and operated. She was a member of Peace Lutheran Church. While living in Maynard, Ardys was active in homemakers club and all community celebrations. 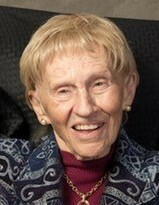 Singing was a passion for her and participated in the Sweet Adelines for 43 years. She sang in and directed many choruses and quartets. Some of her favorites being the Harmonimoms, Maxitones and Charisma Chords which was awarded 9th place in international competition in England. Ardys is survived by her children, David Dybsand of Rochester and Lisa (Tim) Wendlandt of New London; grandchildren, Jodi Larson, Scott Dybsand, Katie (Neil) Christenson, Jennifer Wendlandt and Karli (Nic) Kranz; great-grandchildren, Avery, Bennett, Corbin, Grace and Tegan. She was preceded in death by her husband Alton; parents; son, Paul; daughter, Susan and brother, Don Hinderks. Ardys’ family would like to thank the staff of Bethesda Memory Care Unit for their loving and compassionate care.